Spoiler alert! This adorable duo has the sweetest love story and proves that long distance relationships can overcome all obstacles! Kristin and George had an instant connection that according to the bride, was almost too good to be true. But all it took was two more dates, complete with a hike, kiss, and lots of conversation for the two to realize they found someone special. Although Kristin and George lived on opposite sides of the country, they took a leap of faith and they continued to get to know one another over the next year. Despite having 2500 miles between them, Kristin and George traveled to see each other, had long phone conversations, and even had virtual dates, until George packed his car, and moved to California to begin their happily ever after. 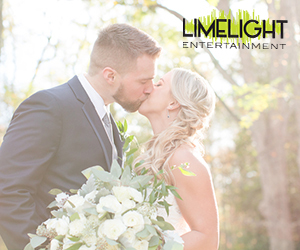 Take a peek at their wedding gallery that’s equally as romantic as their story captured through the lens of Lisette Gatliff Photography. From Lisette Gatliff Photography…A wedding in Huntington Beach, CA meant lots of sun, palm trees, and blue skies. The venue was the elegant Hilton Waterfront Beach Resort, which was the perfect setting for Kristen and George’s classic wedding style. Beautiful greens and bold burgundy and touches of peach made for a beautiful color combination which was seen in the florals, centerpieces, and bridesmaid dresses. The bride wore a beautiful lace dress with a long veil while the groom wore his Coast Guard best. The ceremony took place on a terrace overlooking the beach with tall palm trees as a backdrop. Friends and family rejoiced and became emotional as did this sweet couple when they read their handwritten vows to each other. The reception was held inside one of the resort’s ballrooms, and red uplights made for a pretty and vibrant background. A highlight of the night was when they put a cool spin on the cake cutting tradition by using George’s Coast Guard officer sword. It was a wedding that was as fun as it was romantic.